John Innes Centre scientists are among an international team who have discovered a new class of compounds that target bacteria in a unique way. The JIC team, along with scientists from GlaxoSmithKline and Sanofi, have reported that the new class of compounds inhibit bacterial DNA gyrase and show activity against some drug-resistant strains in the laboratory. Antibiotics are an essential component of modern clinical care, used to prevent and treat bacterial infections. However, the dependence on antibiotics and their widespread misuse has led to bacterial pathogens evolving resistance to an ever-wider range of treatment options. 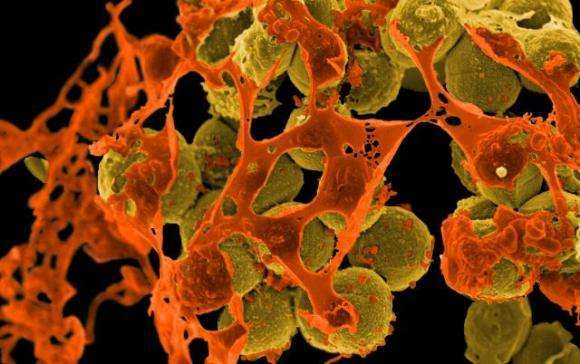 The emergence of multi-drug resistant bacteria has brought a marked increase in the number of untreatable infections, and tackling this problem constitutes one of the major global challenges facing humanity. This research, carried out by scientists from Professor Tony Maxwell's group at the John Innes Centre and partners in the pharmaceutical industry, was reported in Proceedings of the National Academy of Sciences (PNAS). Professor Dale Sanders, Director of the John Innes Centre, said, "This discovery highlights the impact of partnership work between leading pharmaceutical companies and our innovative plant and microbial scientists." The collaborative research was facilitated by the ENABLE (European Gram-negative Antibacterial Engine) consortium, part of the EU-funded Innovative Medicines Initiative's 'New Drugs for Bad Bugs' (ND4BB) programme. The new research reveals that the compounds inhibit a bacterial enzyme called DNA gyrase in a different manner to other known gyrase inhibitors. "Bacterial chromosomes are tightly coiled, but for bacterial cells to replicate these coils must 'unwind' so that the DNA code can be accessed and copied. DNA gyrase creates a cut in the DNA, which allows it to uncoil before the cut ends are reconnected. This creates the opportunity for DNA-replicating enzymes to access the DNA. "Inhibiting DNA gyrase is lethal for the bacterium because it can no longer replicate its DNA." Compounds that act on DNA gyrase are not new; in fact, a common and extremely effective class of existing antibiotics called 'fluoroquinolones' is among a number antibiotics that do exactly that. However, most of the antibiotics which act against DNA gyrase work in a similar way, meaning that when bacteria evolve resistance to one, they may also be resistant to the others of the same class. But the newly discovered compounds inhibit DNA gyrase in a completely different way. Postdoctoral scientist Dr Thomas Germe explained: "Unfortunately, many dangerous bacteria have already developed resistance to fluoroquinolones, so these may not be successful in treating some resistant infections. "After screening a collection of compounds, one compound – known at this stage as 'Compound 1' – was found to inhibit DNA gyrase in a new way." "Fluoroquinolones work by blocking DNA gyrase at the point at which it interacts with DNA. Compound 1, however, doesn't interfere with the DNA at all; rather it binds to a 'hinge pocket' in the other side of the enzyme's structure, which prevents the enzyme from swinging into the correct position to do its job." But the discovery doesn't end there. Professor Maxwell said: "Structural analysis revealed that if the chemical structure of Compound 1 was modified slightly, it would fit more tightly into the 'hinge' region of the DNA gyrase enzyme. This led to 'Compound 2', which is better DNA gyrase inhibitor, Both Compounds 1 and 2 prevent the growth of bacterial strains that are resistant to fluoroquinolone antibiotics in the laboratory." "Although the work on this compound series was stopped due to toxicity, this discovery shows that we can continue to identify novel compounds working in partnership with the pharmaceutical industry and it highlights the importance of collaborative effort, including European-funded collaboration."